One of my interests is old billheads (headed paperwork) used by companies that were involved in the motor industry years ago. 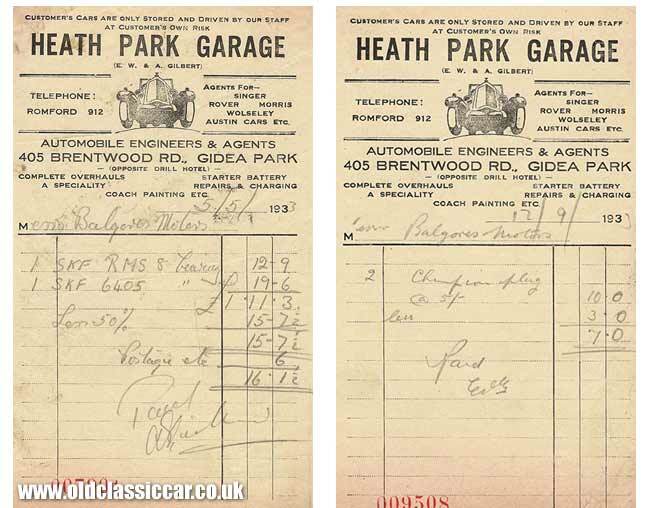 The two pieces of memorabilia shown here are headed receipts issued by Heath Park Garage to Balgores Motors. Heath Park were Automobile Engineers and Agents located on the Brentwood Road, Gidea Park - opposite the Drill Hotel apparently. This Romford garage was an agent for Singer, Rover, Morris, Wolseley and Austin cars. They offered a good variety of services for the 1930s motorist - complete overhauls were a speciality, as was coach painting. You could also get your batteries repaired and recharged at this establishment. This billhead features some nice artwork, showing a vintage car roaring along the road. Both receipts were issued in 1933, and both to Balgores Motors. The earlier one, from May '33, was for SKF bearings, and the later receipt, from September of the same year, for 2x Champion spark plugs.